Cold is hot this season. Spice up your get-togethers and soothe your winter blues with our Orange Pomegranate Iced Tea. Filled with cinnamon, pomegranate and orange, it makes for the perfect winter drink. Fill the pitcher with ice, cinnamon sticks and sliced oranges. Save some of the sliced oranges and cinnamon sticks to garnish. Fill the water tank with fresh cold water, and place 8 bags of orange pekoe tea (or your desired portion of loose tea) to the filter basket. Push the brew button, and allow the tea to brew. Once brewing is complete, pour the ½ cup of pomegranate juice, and sugar to taste, into the pitcher and stir. Pour into tall serving glasses and garnish with orange slices, cinnamon sticks, the cloves, or even pomegranate seeds, and enjoy! Searching for a gift that shows Mom you care this Mother’s Day? The Capresso Coffee à la Carte is the ideal choice. Whether Mom enjoys a morning cup of joe, a soothing glass of tea or serving coffee to friends at a dinner party, the Capresso Coffee à la Carte combines a drip coffee maker, single serve coffee machine and a tea brewer all in one stylish, compact unit. Mom the Coffee Lover: The machine’s innovative brewing system allows Mom to brew a single cup of coffee in less than 60 seconds. Fully customizable, the system adjusts to the amount of ground coffee in the filter, which can hold up to 12 tablespoons, fully saturating it for the proper amount of time. Brewing buttons are easy to find and operate: simply choose the preset Small Cup or Large Cup button for single cup coffee, press and hold, then the machine goes to work. 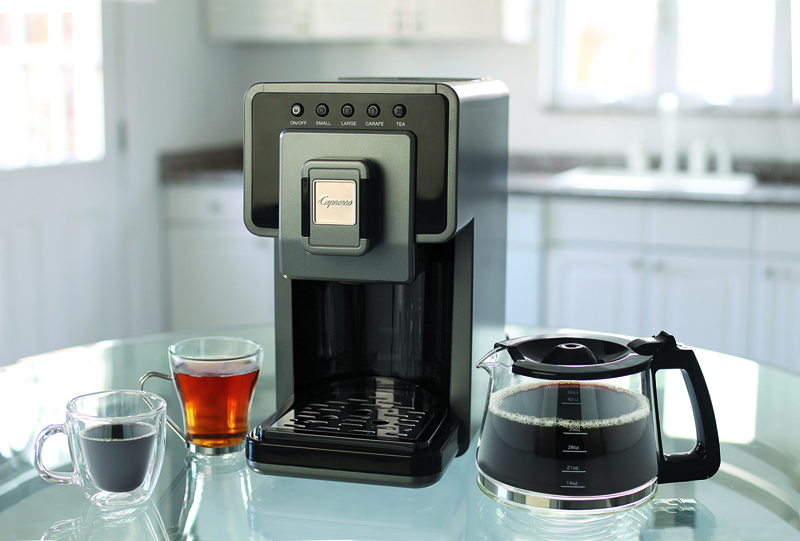 Plus, the unit brews from ground coffee, eliminating the need for expensive and wasteful pods or capsules. Mom the Tea Lover: The versatile Coffee à la Carte is a premium pick for tea drinkers. An additional filter is designated for tea, preventing any flavor exchange between coffee and tea. Mom can brew a flavorful cup of her favorite loose or bagged tea in seconds with the programmable tea button, which rapidly steeps a cup from 5 to 10 ounces. Mom the Hostess: Entertaining is easy with the Coffee à la Carte. Mom can brew delicious hot coffee into the 42-ounce glass carafe in less than 6 minutes. The quick-heat 2.2 bar Italian-made pump system always brews to the optimal temperature, above 200 degrees F, ensuring a tasty brew for Mom’s guests. To learn more about the Capresso Coffee à la Carte, visit Capresso.com.